Wedding season here. I have attended few of my friend's wedding and few more to come next week. Though the food served at wedding was something special and tasty, my mind wanted to crave home made simple food. My MIL prepared plain dal for me and I prepared Kothavarangai puli kootu (Cluster beans in tamarind sauce) for me to satisfy my taste buds. Huh..Nothing can beat this combo. Simply awesome. Though Cluster beans are not having any noticeable vitamins, it is rich source of soluble fibre content and are known for their cholesterol lowering effect. So try to include them in your meal. 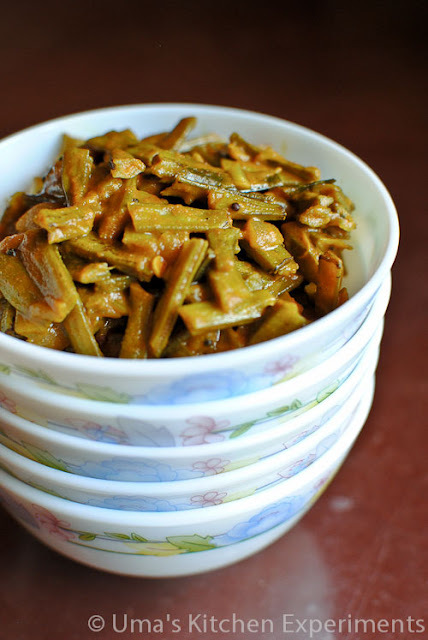 It can also be called as Seeni Avaraikkai in Tamil and Chikkudukaya in Telugu. They give very slight bitter taste if you have not picked the tender one. Tender one cooks fast and goes well with curd rice, steamed rice with dal and steamed rice with sambar. I sometimes have it with chapathi too. Now, off to the recipe. 1) Soak tamarind in 3/4 cup of warm water. 2) Remove the fibre strings from each side of the cluster beans. Chop them into an inch length pieces. 3) Take a frying Pan / Kadai / Sauce pan and heat oil in it. 4) When the oil is hot and not smoking, add the mustard seeds. 5) Mustard seeds starts to crackle and when the sound of cracking reduces, add the onion and curry leaves. 6) Saute them for 2 minutes or till the onion turns soft and translucent. 7) Add chopped cluster beans. Sprinkle the water. Cover and cook for 5 minutes. 8) After 5 minutes, the cluster beans have turned to soft and almost cooked. 9) Add salt, sambar masala and mix well. Cook for another 3 minutes uncovered. 10) Now, extract the tamarind sauce and add this sauce to the frying pan. 11) Allow a single boil. Cover and cook for 5 minutes in low flame. After 5 minutes, open the lid and cook until the cluster beans becomes soft and it reaches the kootu consistency. 12) Adjust the salt as per your taste and serve hot. 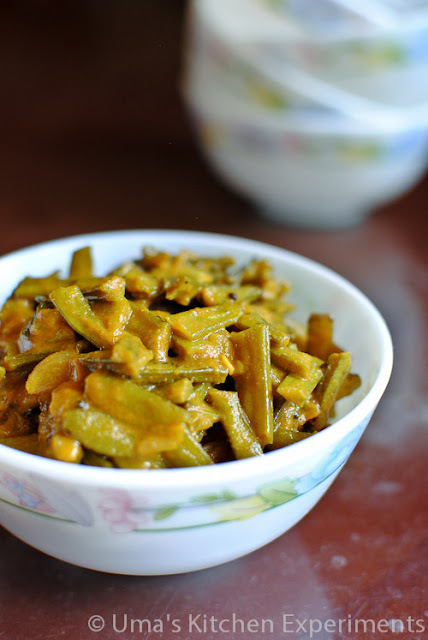 13) We enjoyed this with Plain Dal with Steamed rice and Curd Rice. 1) If you are using tender cluster beans, it cooks fast than the specified time mentioned here. So keep watching the pan and cook accordingly. 2) Increase or decrease the sambar masala quantity as per the spiciness of the sambar powder. 3) Increase or decrease the tamarind as per the taste. Its been ages since I had kothavaranga. Looks comforting. 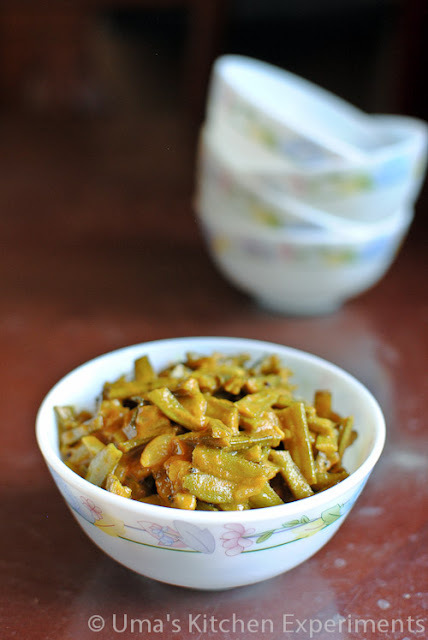 wow...beans in tamarind sauce....a must try..drooling over the pics dear...looks so so delicious !!!! This is new to me...I have always tried stir fry with it never any curry..Looks delicious..
Yumm, love these. Never see the fresh beans here though and frozen ones are so awful. Never tried adding tamarind with this beans, sounds awesome and tangy Uma. Cluster beans with tamarind sounds interesting! Sure this would have tasted great with hot rice...will try this for sure!! Its new to me..Sounds delicious. I am unsure what cluster beans are, they seem to resemble green beans or string beans. The tamarind sounds wonderful. Yummy recipes...happy to follow u..